1. Wash the kale thoroughly. Bring a large pan of lightly salted water to the boil. Plunge the kale into the water, bring back to the boil then simmer for 5 minutes or until just becoming tender. Drain thoroughly and put into a warmed serving bowl. 2. Meanwhile, on a chopping board, finely chop the bacon with the leaves from the rosemary. Warm a large frying pan over a high heat and add the butter. When it starts to froth add the bacon mixture and stir-fry for 2-3 minutes, breaking up any clumps of bacon with your wooden spoon. Add the oatmeal and fry, stirring often, for a further 1-2 minutes, until crisp and golden. 3. Remove from the heat and pour over the kale. Add the lemon zest and some seasoning to taste, then toss well. 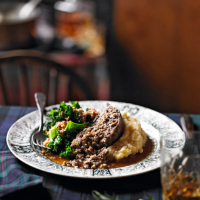 Serve immediately with the haggis and mash.